24b [Then they nailed him to the cross.] 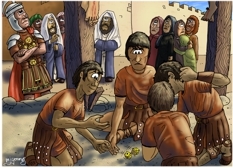 They gambled for his clothes, throwing dice to decide who would get them. The sun is already high in the sky & shining down on the scene from the rigth. The sun is casting deep, blue shadows off to the left. Only the feet of Jesus, on the cross are visible at the top of the scene. The Roman Centurion can be seen to the left of the cross, looking up at Jesus. You can see four Hebrew figures behind the Centurion, two are Pharisees (in Blue robes with pale shawls over their heads) & two unidentified onlookers. Apparently, during an execution, a victim’s personal belongings became the property of the Roman execution squad. In this particular case the four-man squad (see John 19:23) cast lots for His clothes; an inner and outer garment, a belt, sandals, and perhaps a head covering. 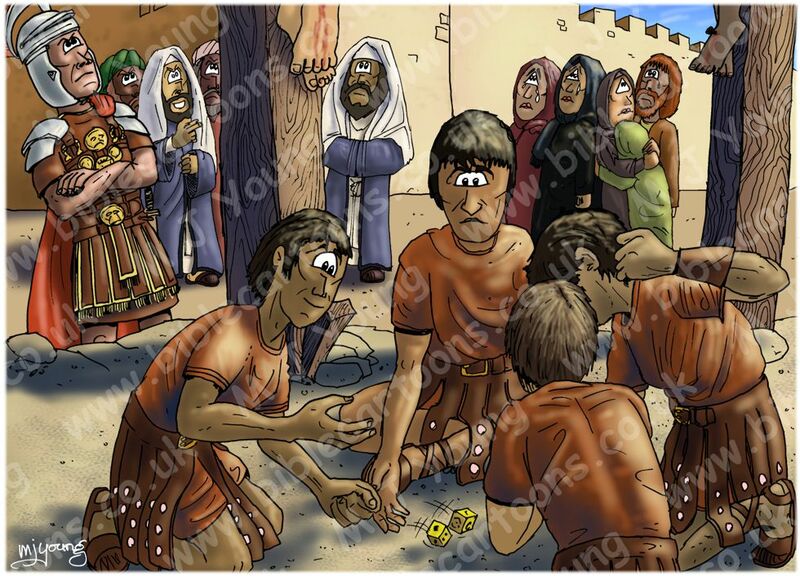 casting lots could have been done using dice, as I have illustrated in this scene.